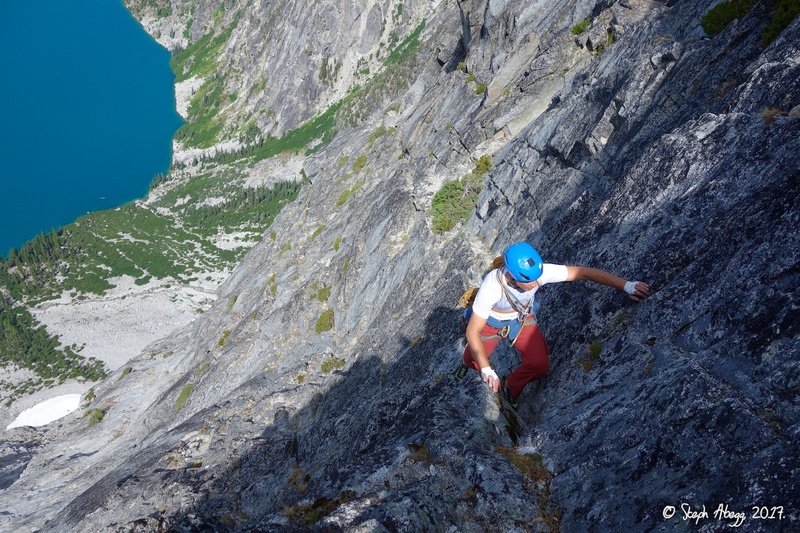 Steep and stellar climbing on Dragontail. Had a close call on the descent but otherwise a great day. 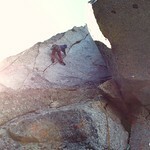 Kevin styling the 5.11 fingercrack on Pitch 2. 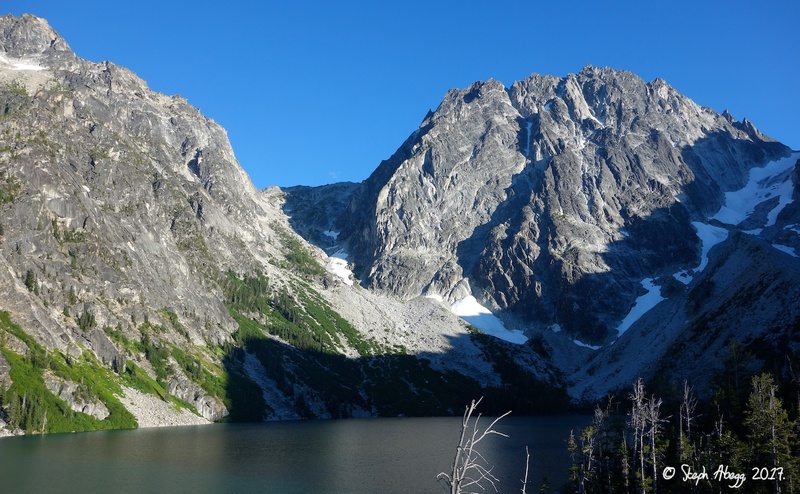 Dragontail Peak towers over Colchuck Lake. 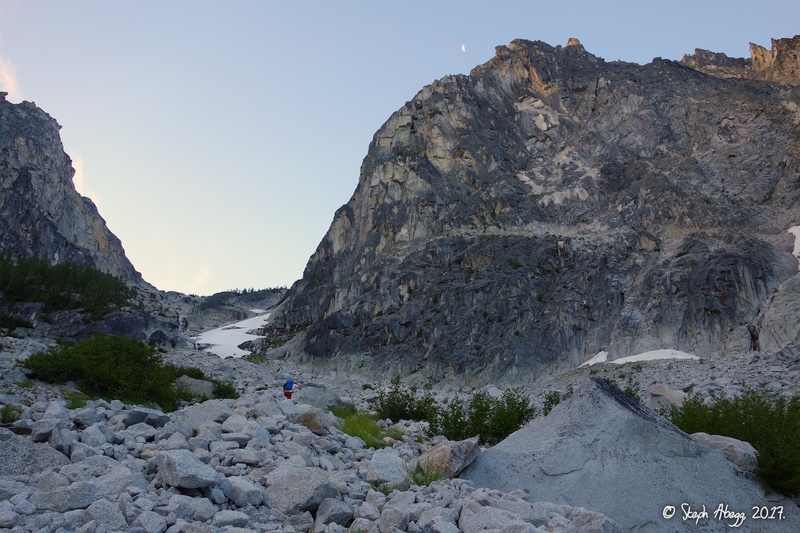 Its complex north face is 3000 feet tall, broken by gullies, fins, ribs, and walls. 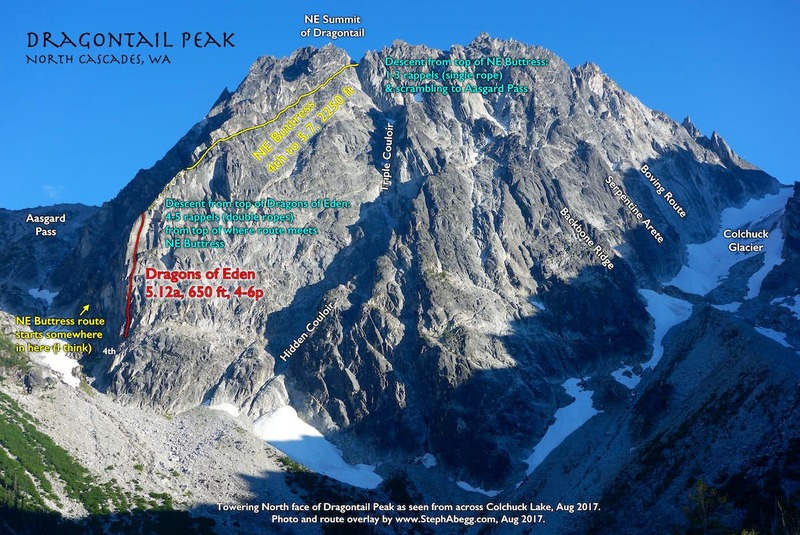 I had climbed Draontail twice before: in 2008, via the Colchuck Glacier route (3rd & snow); and in June 2009, via Serpentine Arete (5.8, 2000'). 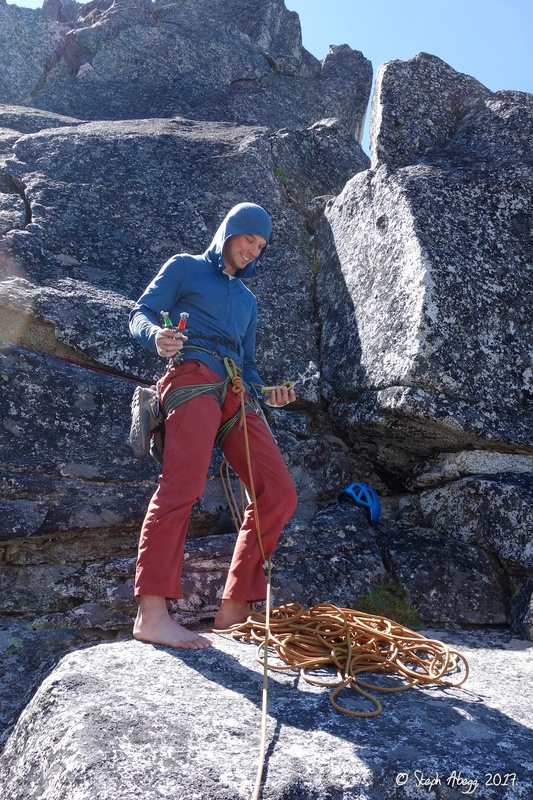 The following is a trip report for my third climb on Dragontail: Dragons of Eden, a 4-6 pitch, 650-foot direct start to the NE Buttress route (Beckey-Burgner-Nephew '71) and joins the buttress crest for the final 1600 feet of easier climbing (4th-5.7) to the top. 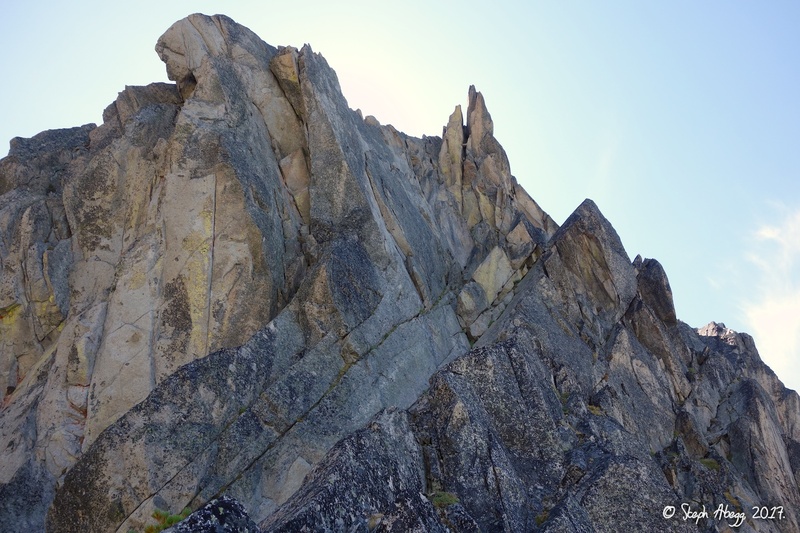 Dragons of Eden features awesome crack climbing on a vertical panel of granodiorite just right of the NE Buttress, with three pitches in the 5.11-5.12a range (or 5.10 C1). 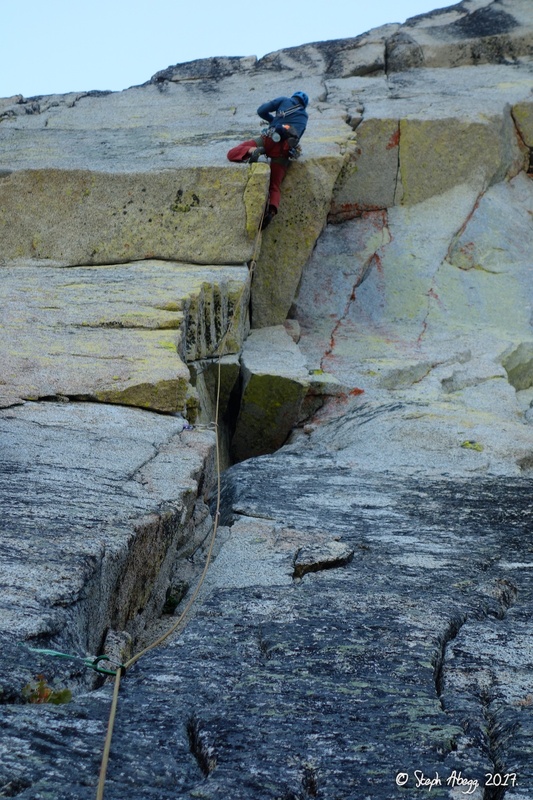 The route was put up by Wayne Wallace and Bob McGown in 1988, but did not see its first free ascent until 2008 (Jens Holsten). 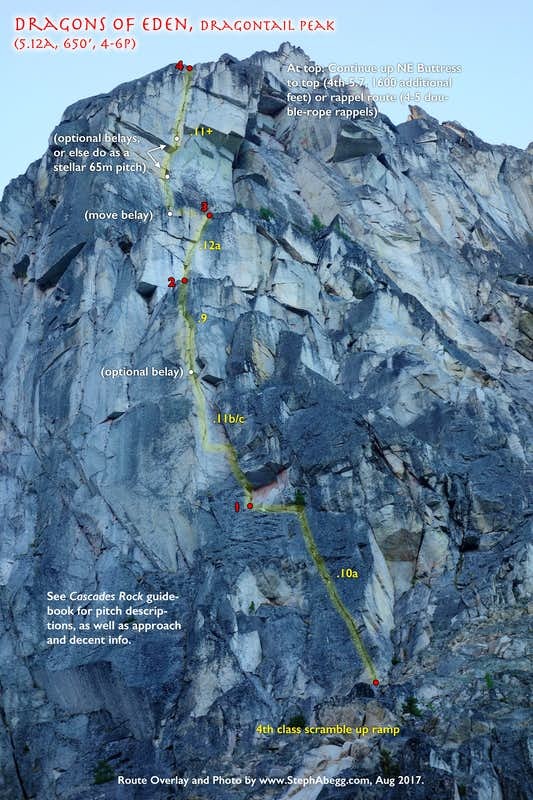 Herrington's Cascades Rock guidebook contains the best route description for this climb. 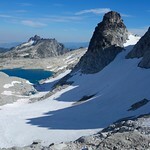 In it, a blurb about the first ascent quotes Wayne: "I got my first taste of Dragontail Peak in 1988. Dragons of Eden is what Bob named the route, after a book he enjoyed. The astounding line pushed through a crazy headwall with insane exposure. 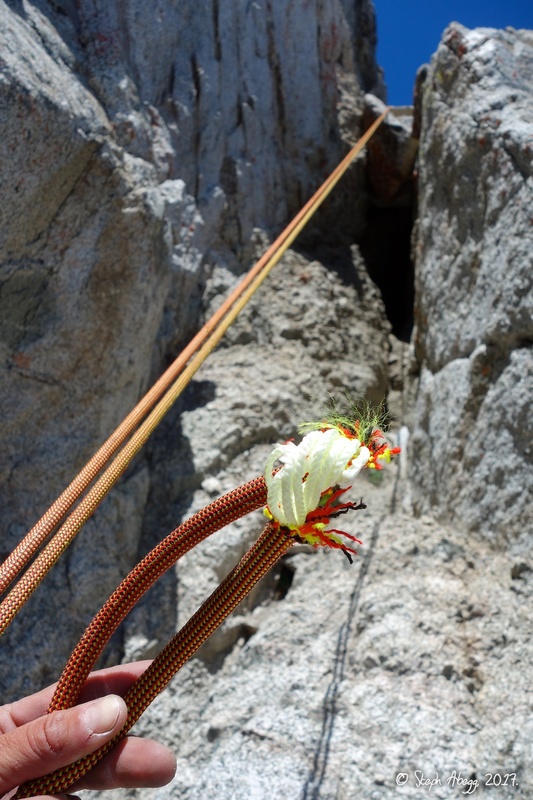 We did take aid on a couple of leads, and made sure the second was able to top-rope it free. That way we could free it on a later trip that never happened...For a long time, I thought this amazing route was doomed to obscurity." 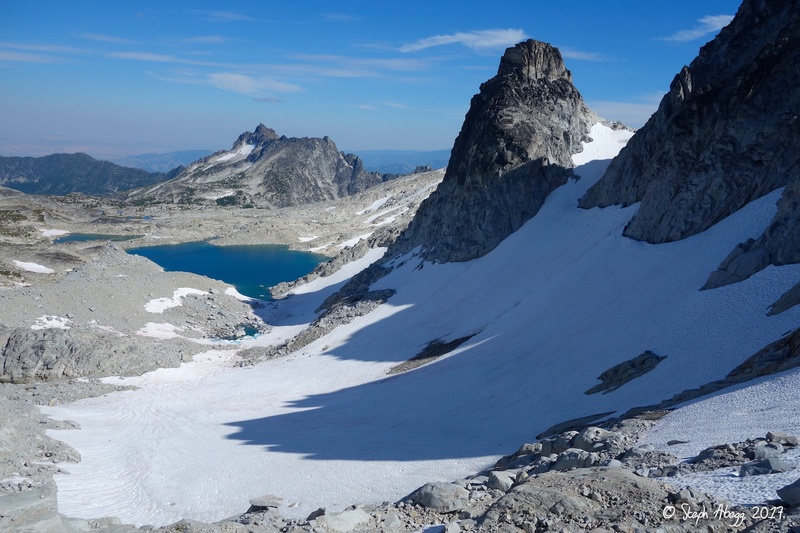 But in the late 2000's, the "Golden Age of NW mountaineering", the route was finally freed and cleaned up to produce one of the area's best lines. 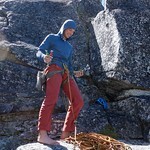 I climbed this route with Kevin Piarulli, who had responded to my "looking for partners to climb 5.10 rock in the Cascades" post (Kevin and I had had an awesome day climbing Ellen Pea on Supercave Wall a couple of weeks previous, so I jumped at the chance to climb with Kevin again). When deciding what to climb, Kevin had suggested Dragons of Eden. 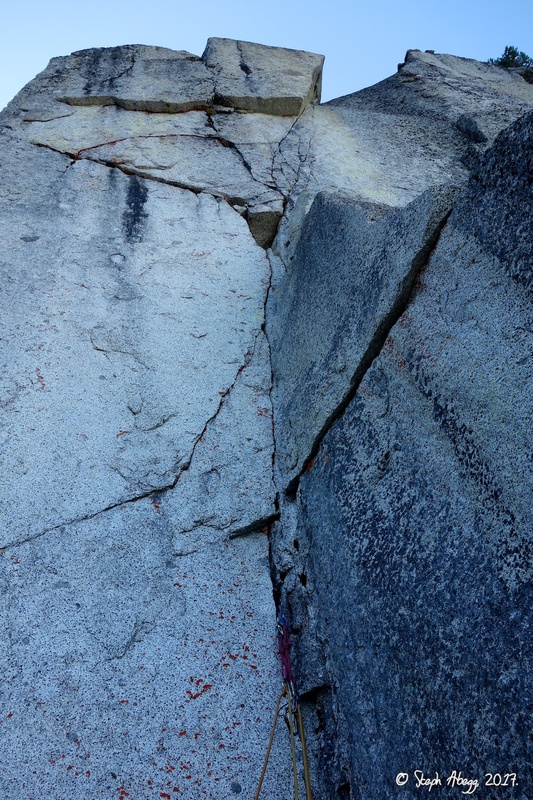 We knew the 5.11-5.12a sections would be challenging, but the 5.10 C1 grade made it sound protectable and a good route to push the grade on. We ended up climbing the route in 4 long pitches; since Kevin wanted to lead the crux sections and because of our pitch-linking, it worked out that Kevin just led the entire 650-foot route, finishing it off strong with an impressive no-take-no-fall 65m lead of steep and sustained 5.11 climbing to where the route tops out on the NE Buttress. 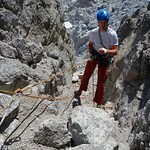 I was happy to enjoy the route from the comfort of a toprope. As a team, we onsighted the route clean (Kevin took no rests and had only one fall at the 12a crux and proceeded to lead it clean, while I onsighted the 12a crux but aided the 11- roof on the last pitch to avoid potentially dangling in space if I fell and also ended up having to rest 20 feet shy of the top of the pitch before the final push to the top). 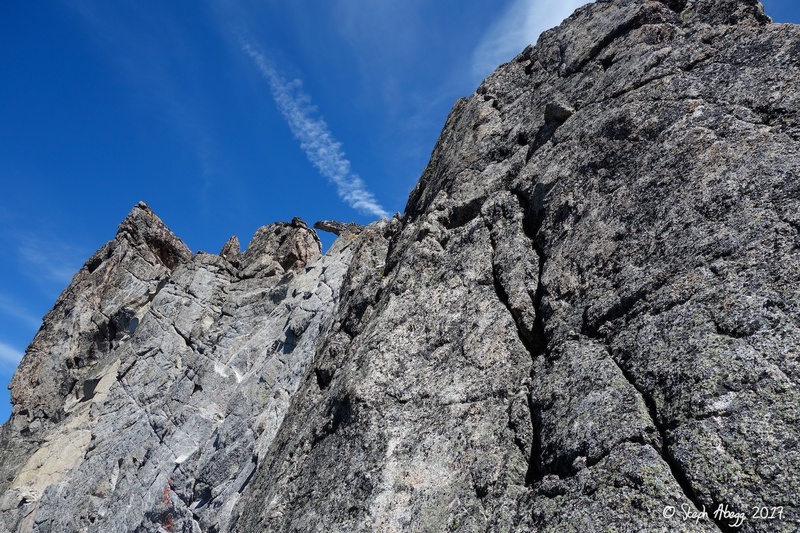 Rather than rappel from the top of the 650-foot route (it apparently requires 2 ropes to rappel), we decided to just climb the route with one rope and continue 1600 more vertical feet to the top of Dragontail via the NE Buttress. 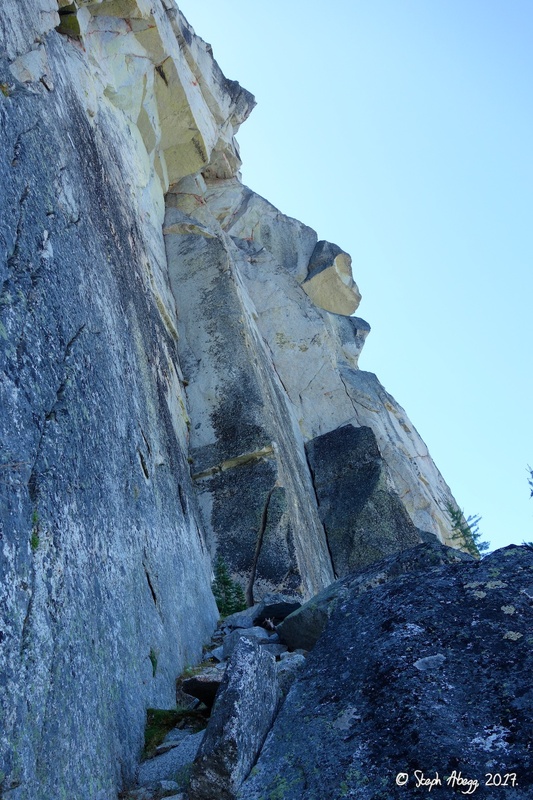 This was mostly 4th class with an occasional 5th class move (up to 5.7) and we comfortably soloed it in rock shoes (simulclimbing it would not really have been a great option due to the looseness of the rock and poor protection opportunities). It went quickly, but was somewhat unremarkable climbing that somewhat detracts from the high quality steep splitters of the Dragons of Eden route below; the merits of doing the NE Buttress continuation are the sense of completion, the nice views of the Enchantment Basin on the descent, and being able to climb Dragons of Eden with just one rope. 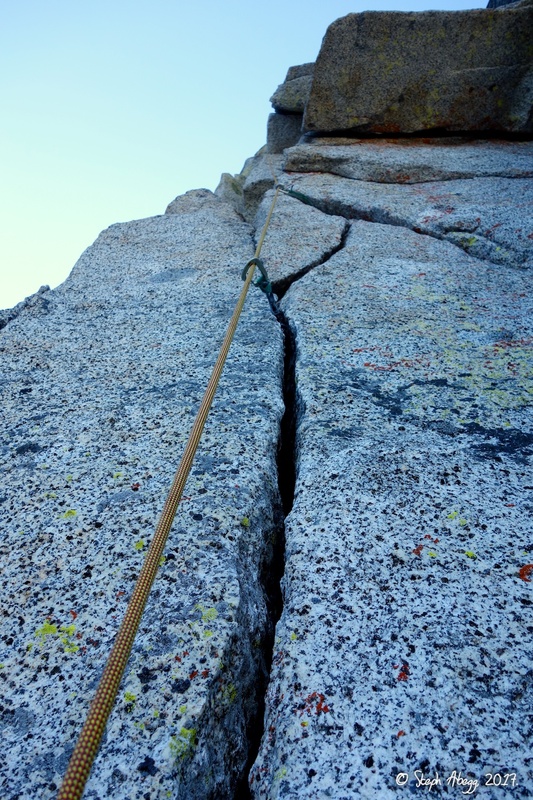 Perhaps our "meh" feelings about the NE Buttress were tainted by a close call we had on the descent, detailed as follows.... 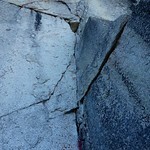 The rock is very rotten where the NE Buttress route finishes and where you must rappel to get off of the route. Just below the first rappel, Kevin was clipping into a rappel station on a horn when the entire horn peeled off the mountain, pulling Kevin with it; the horn probably weighed at least half a ton (according to Kevin, it was about a quarter of a cubic meter in volume, and the density of granite is 2650 kg/m^3). Fortunately, the rappel sling Kevin had clipped to pulled off the horn as it fell and Kevin was still attached to our rappel rope with a gri-gri (we had brought one gri-gri and one ATC, so Kevin being the first one down was rappelling with the gri-gri on a fixed line). We were a bit shaken, but fortunately the only casualties—at this point at least—were my brand new Maxim 9.1mm 70m rope (now a much less useful 53m length due to a compete core shot) and Kevin's favorite pants (now likely to become shorts). But we were not out of danger yet. 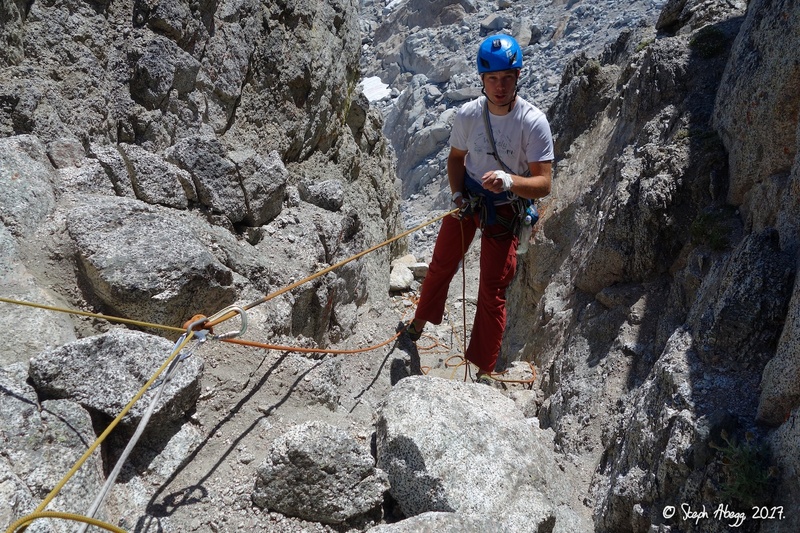 Because our rope was now shorter, the plan was for me to set an intermediate rappel off another rap station we had spotted on a chockstone not far above the horn Kevin pulled off. 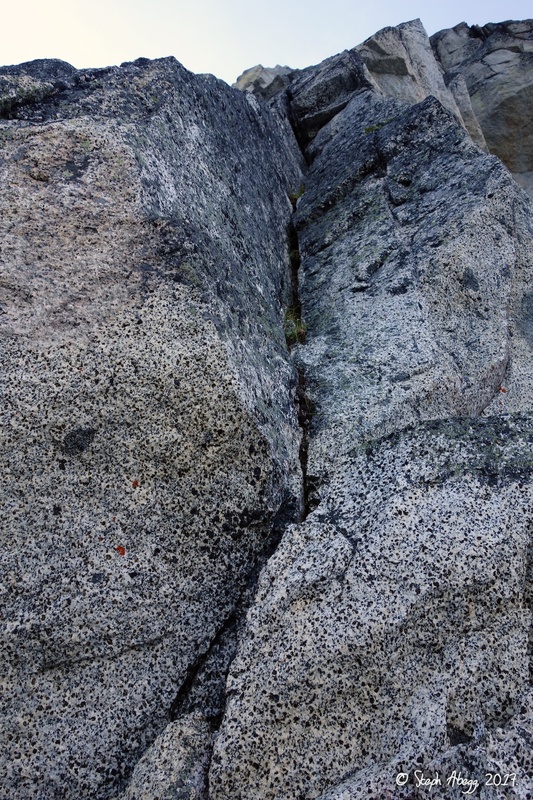 But when I got to this chockstone and began to inspect the tat, the tat turned out to be just held in place with a bunch of loose rocks that had fallen from above and the tat was not even around the chockstone; it appeared that the chockstone had shifted at some point and dislodged the tat. Meanwhile, while I was maneuvering around this giant potentially-loose chockstone that had suddenly become much more ominous, Kevin had gone looking for a good rappel horn; he spotted a couple of slings dangling side by side on the face, one held by a small nut and one by a knifeblade piton, which looked promising until both the nut and piton fell out when he touched them. Yikes...seemed like the mountain was trying to tell us something. 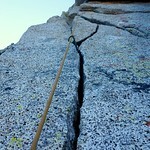 Now completely wary about the idea of rappelling at all, we did some sketchy downclimbing to safer ground. 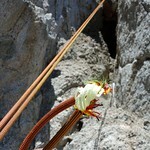 The experience was a reminder to always be skeptical of rappel stations in the mountains. 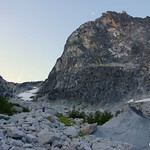 (Here's my suggestion for the descent: With a 70m rope, make just 1 rappel from the anchor at the notch at the top of the NE Buttress route; from the end of the rope, carefully scramble loose 3rd class terrain to skier's right and get down to the more solid boulders below—no more rappels needed down the dangerous gully.) 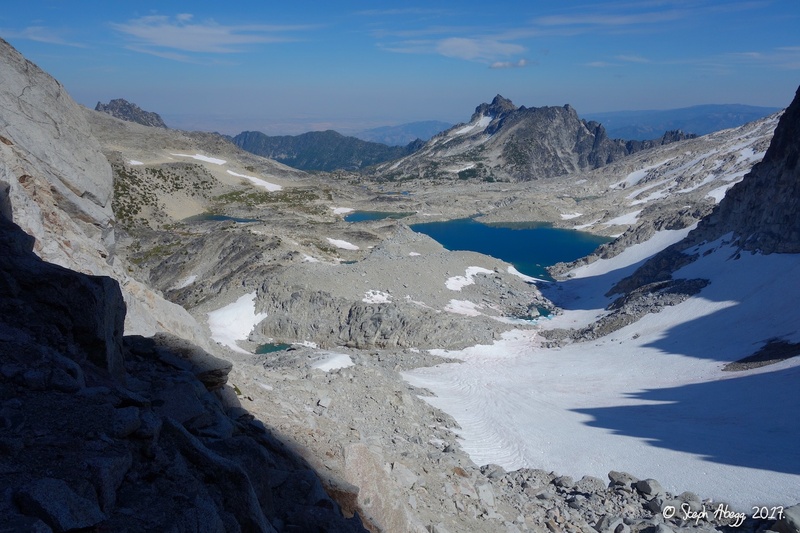 Once down on solid ground and given a chance to shake off the last hour of events, Kevin and I enjoyed the relative romp down to Asgard Pass with views of the Enchantment Basin below. 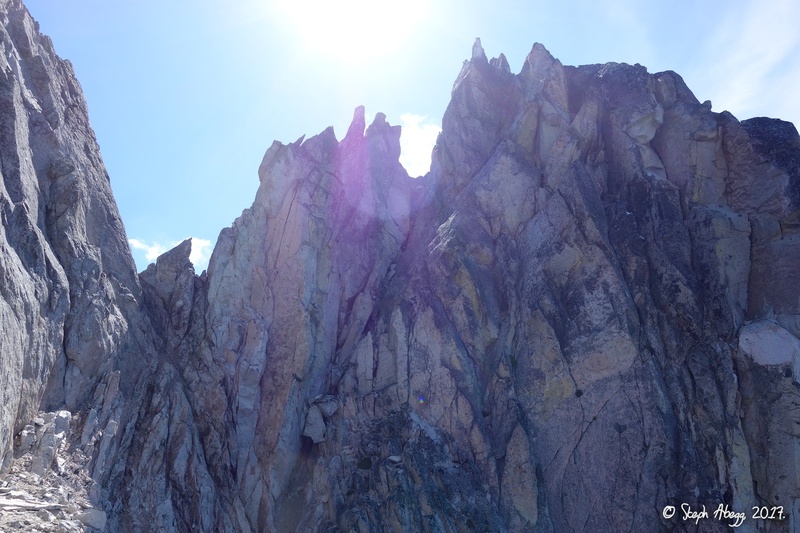 The following page gives and overlay and photos from the climb of Dragons of Eden. Thanks for the fun day Kevin! Leave trail going up to Aasgard Pass, ~3 hours from car. 1. 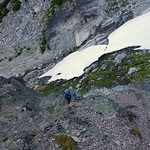 Approaching the NE Buttress. 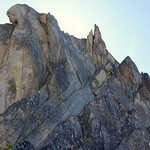 Dragons of Eden is essentially a direct start up the steep panel of granite on climbers' right of the actual buttress. 2. 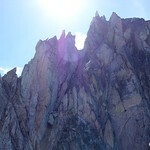 Looking over the lower NE Buttress / Dragons of Eden. 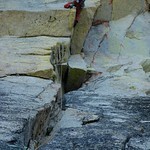 Getting to the base of the route requires a bit of 4th class scrambling. 3. 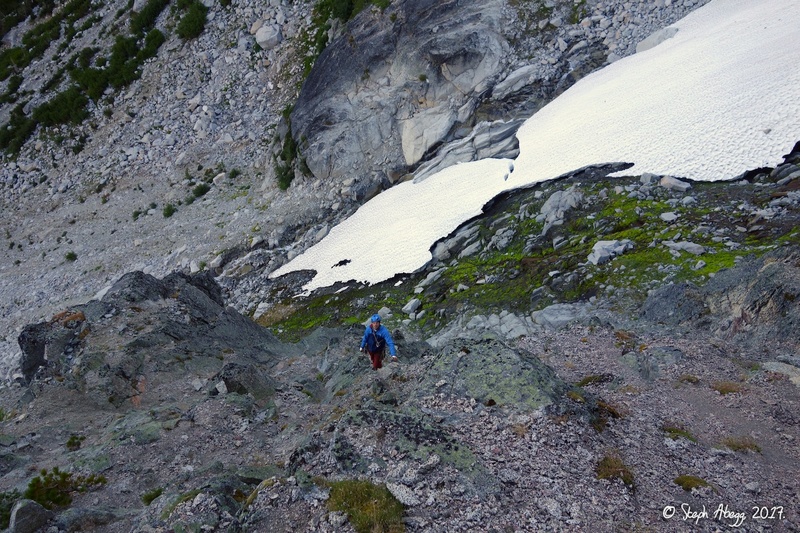 Scrambling to base of route. 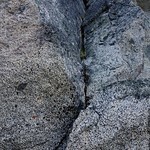 The rock is a bit loose here. 4. Looking up the start of Pitch 1. 5. Handcrack midway up the pitch. 6. 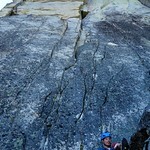 Kevin styling the 5.11 fingercrack on Pitch 2. On the mountainproject description of the route, this pitch is compared to Yorkshire Gripper (11b, Squamish) or Butterballs (11c fingers, Yosemite); I have not climbed either of these routes so cannot comment, but while Squamish/Yosemite are hard acts to follow, it is true that this pitch on Dragons of Eden is pretty stellar climbing. 7. Splitter fingers to off-fingers on Pitch 2. 8. Flare and fun double cracks. 9. Looking up Pitch 3. 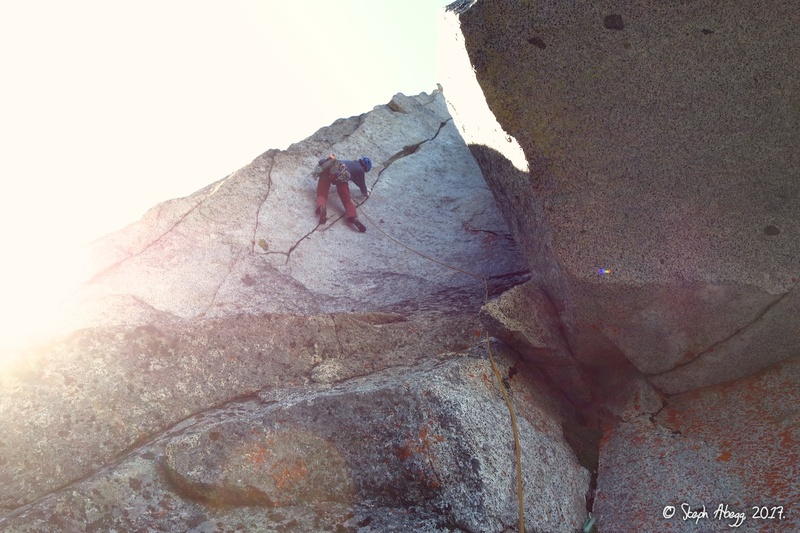 The 12a crux of the route is between the top of the pillar and entering the leaning corner that finishes the pitch. Kevin's foot popped as he was entering the corner, but he got right back on and led it cleanly. 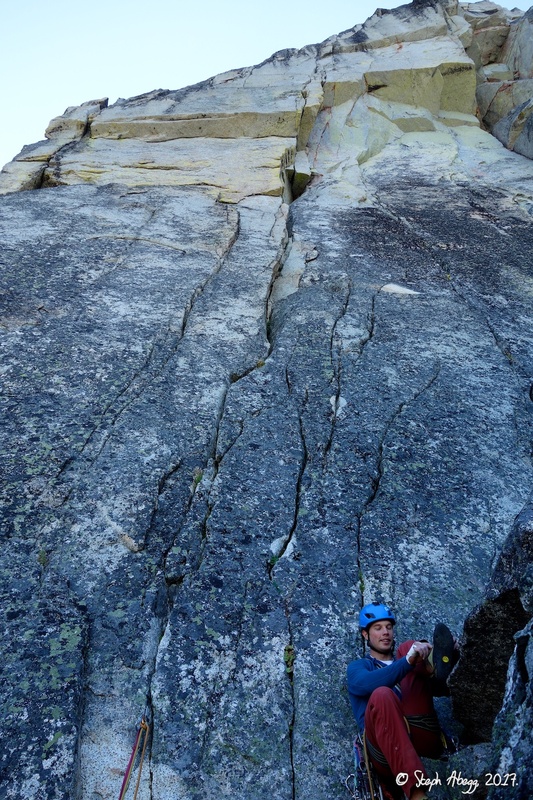 I struggled on a couple of face moves below the corner, but somehow managed to stay on the rock and got through the pitch cleanly. The finger locks in the upper corner were awesome. 10. 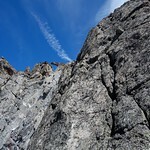 Looking up Pitch 4, which tops out on the NE Buttress. 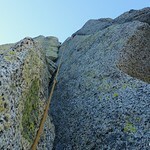 This pitch is a rope-stretching 65m and quite sustained, and can be broken up into a couple of pitches. 11. Kevin just after pulling through the 5.11- roof. 12. Taken while following the pitch. The 5.11- roof looms above. 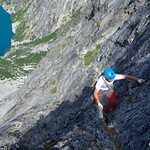 Wild climbing. 13. 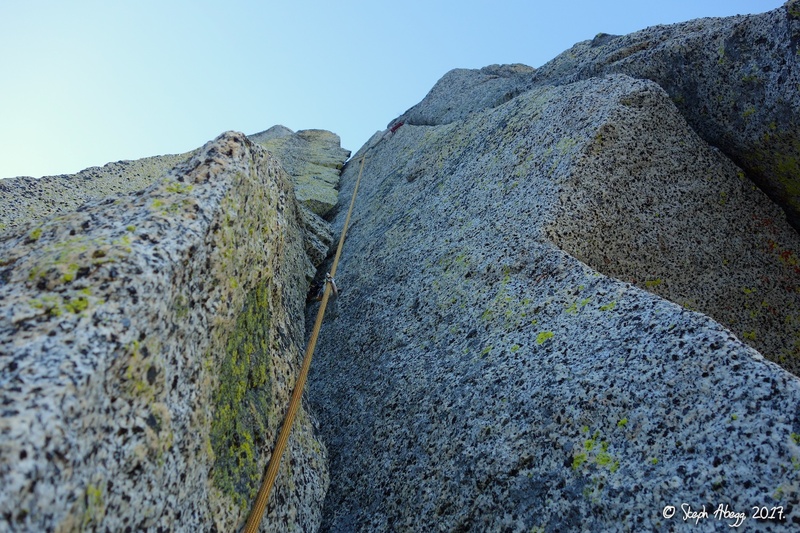 Kevin finished his 65m lead with a pretty light rack (but pretty heavy rope). 15. 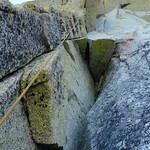 The NE Buttress mainly follows this ramp system on the right side of the crest, all the way to the top. 16. 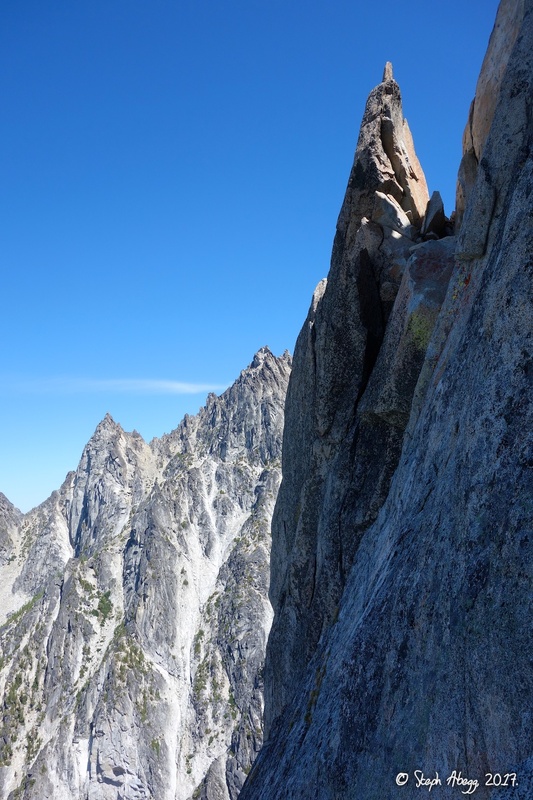 A gendarme on the NE Buttress. 17. 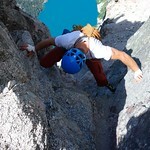 Scrambling on the NE Buttress. 18. 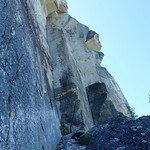 The NE Buttress route ends at the notch on the left in the photo. The NE summit is to the left of the notch. 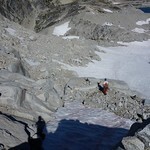 The true summit of Dragontail is to the right by a bit and separated by some steep looking gendarmes. 19. Getting to the notch entails having to climb up a section of appallingly rotten rock. 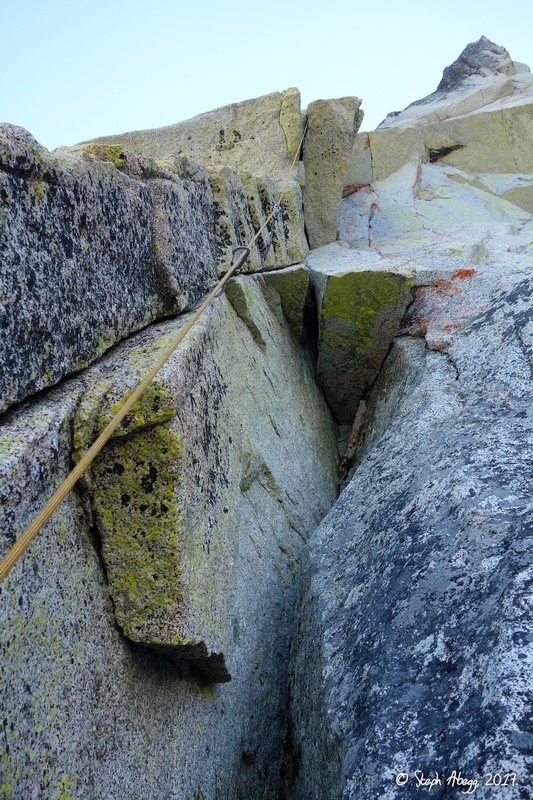 Really nothing you can do to make this safe other than to go one at a time (could have one person solo it and then belay the other up) and be super careful. 20. 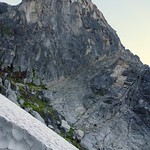 Looking up towards the NE summit from the notch where the NE Buttress route ends. Getting to the NE summit from the notch looked like a pitch of low 5th climbing on pretty decent rock with awesome exposure. However, the looseness at the notch itself had turned us off a bit so we decided not to go to the actual top of the NE summit. 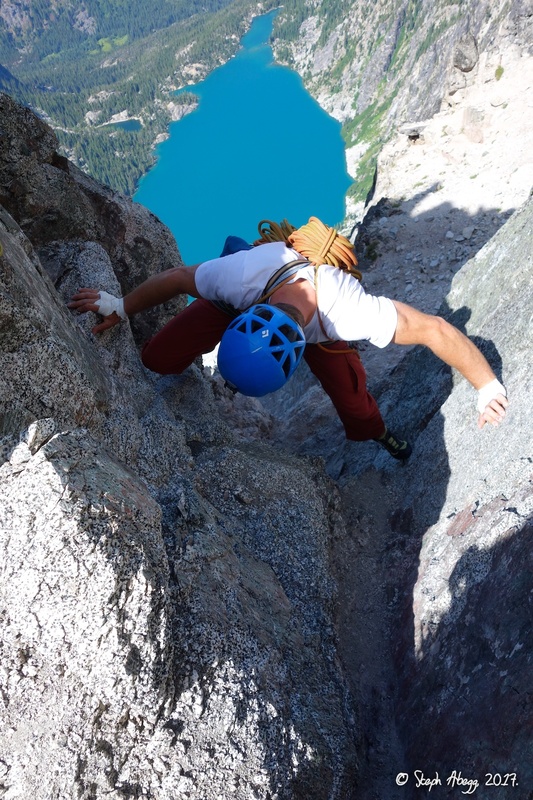 From top of NE Buttress: rappel and then scramble to Aasgard Pass. 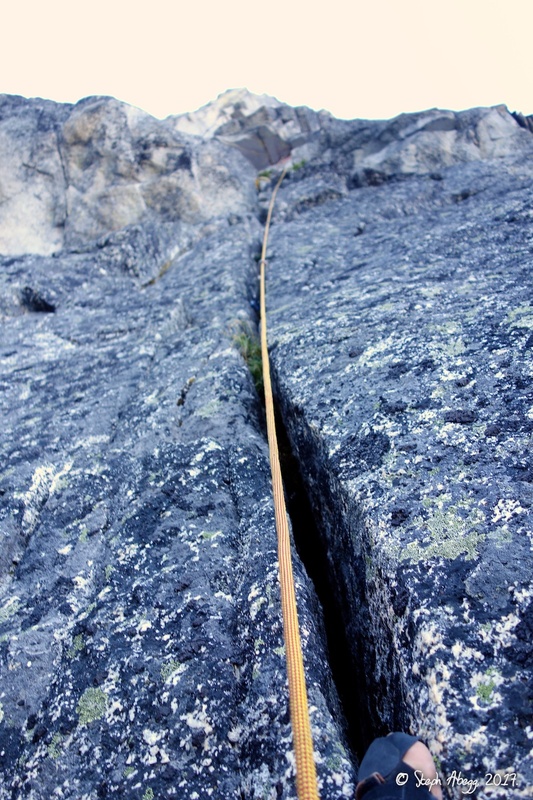 From top of Pitch 5: 4-5 double rope raps. 21. Kevin starting the rappel from the notch. 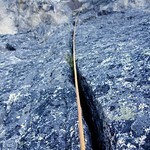 The rappel anchor is a large horn embedded in the notch. 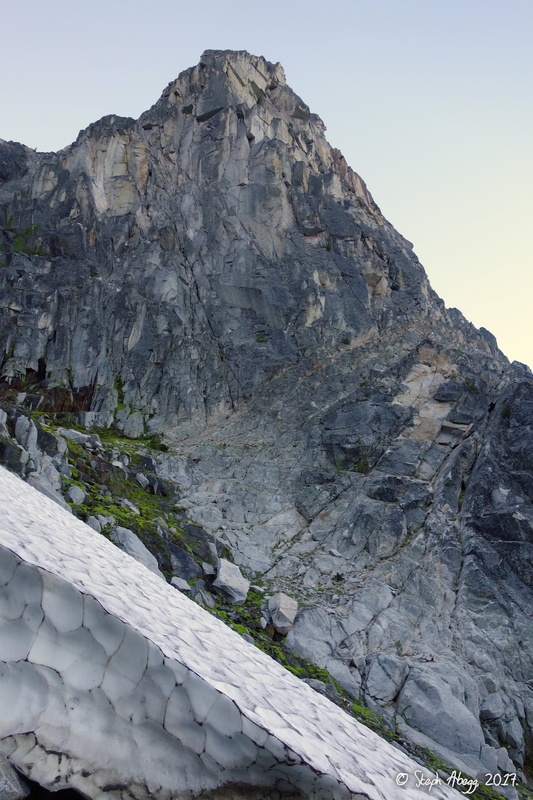 Although the rock at the notch is appalling rotten, the horn appeared pretty glued to the mountain (although what happened 1 minute after I took this photo makes me wonder how well the horn is glued to the mountain....). 23-24. 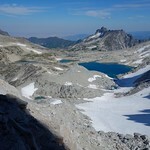 Upper Enchantment basin as seen from the descent from Dragontail. 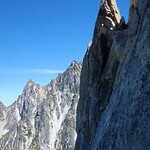 Getting this view is one of the reasons for linking Dragons of Eden with the NE Buttress route. 25. 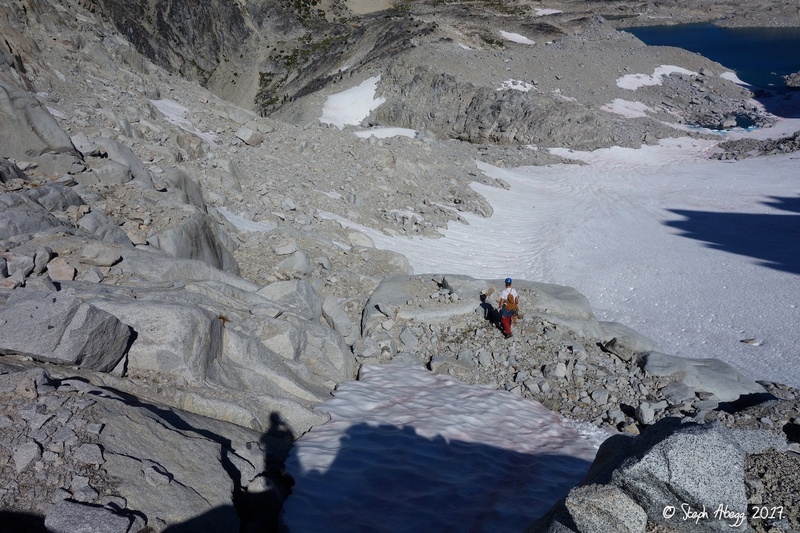 3rd class scrambling down to Aasgard Pass. From Aasgard Pass we got on the trail and hiked down to where we had left our packs near the base of the route. 26. 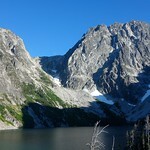 Dragontail as seen from across Colchuck Lake on the hike out.